For half of the day our office was filled with the smell of some plastic burning. There’s an incineration installation nearby and when the wind blows in our direction, the impression is that organic compounds are being burnt right under your nose. At the end of the day I left the office and went to the tram stop. There were several people waiting for the tram there. All of a sudden I felt cigarette smoke (which I usually hate): a grey-haired man was standing right behind me puffing at his cigarette. Cigarette smokers only very rarely step out of the queue to inhale a cigarette. They probably think other people enjoy the fumes as much as they do. Having reached the metro by tram I went underground. A heavy stale atmosphere of unwashed bodies hit me in the metro car. In the elevator of my apartment building a dog might have been taken out for a walk (or taken back home from the walk) by its owner a short while before. The acrid smell of the dog was going to fill the elevator for another hour or two. 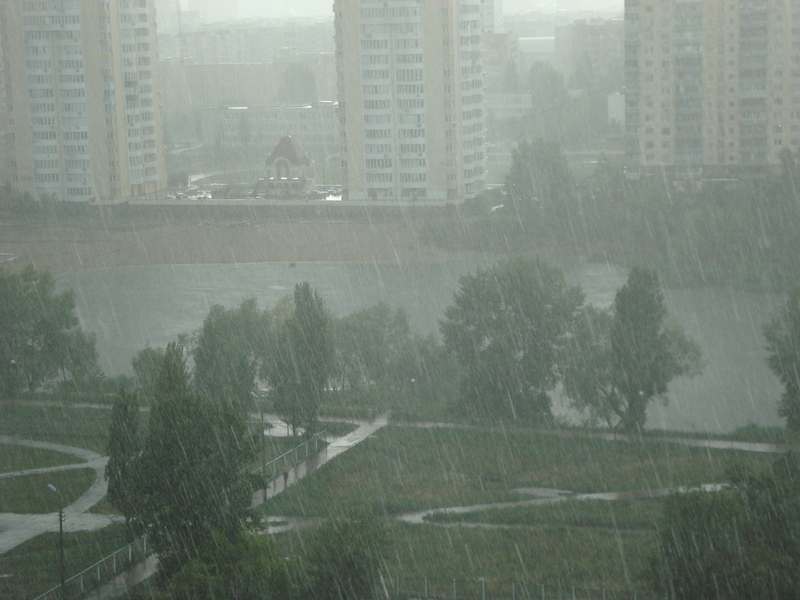 Back home, on the sixteenth floor, I opened all the windows and balcony doors. Powerful gusts of wind started blowing through all the rooms from one end of the apartment to the other, sweeping sheets of paper off the desks, shaking maps and pictures on the walls and flapping curtains out of the windows. 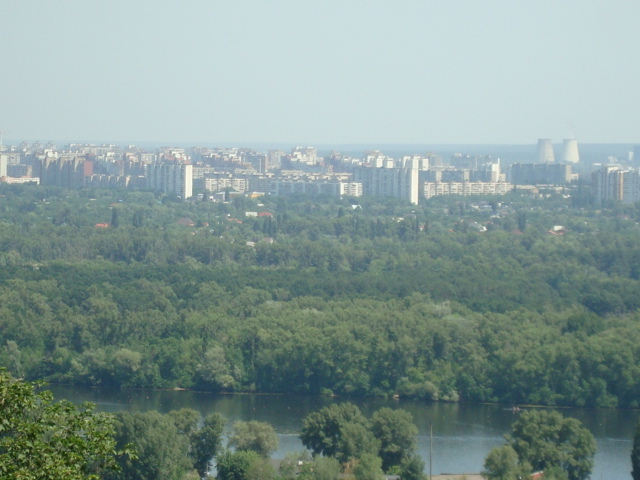 I was peering into the green and blue vistas that stretched for miles and miles beyond the Dnipro. I was basking in all that beauty and freshness. And then it started raining. The rain was heavy and the sun was shining through it. 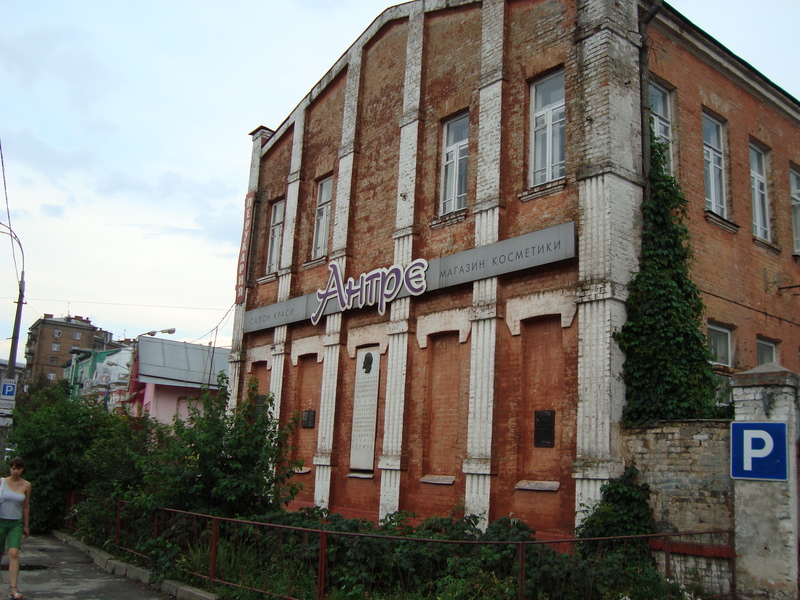 This shabby old building in the Lukyanivka district of Kyiv drew my attention because of the foreignism ANTREE (ENTRÉE) and a couple of commemorative plates on its walls. Later I found out that the “entrée” in this case might be associated with a smaller meal course that usually precedes the main course: at the moment there is an eatery and some shops in this building, which earlier was an administrative center of a large tramway depot right behind it. The fact that the depot was here explains the presence of the tablets. In those days the working class (the “proletariat”) was considered to be the maker of history. Its ideological leaders – communists and the “komsomol” (“young communists”) insisted they were a link in a chain that stretched from the earliest dream-societies, like that in Civitas Solis by Tommaso Campanella, to the future “triumph of communism” all over the globe. Very much like launching space messages to extra-terrestrial worlds containing information about the earthlings, the komsomol used to address future generations who would live “under communism”. Such an address was usually written and announced at a huge rally, then encapsulated in a compact container, solemnly put into a niche in the wall and covered with a plaque. 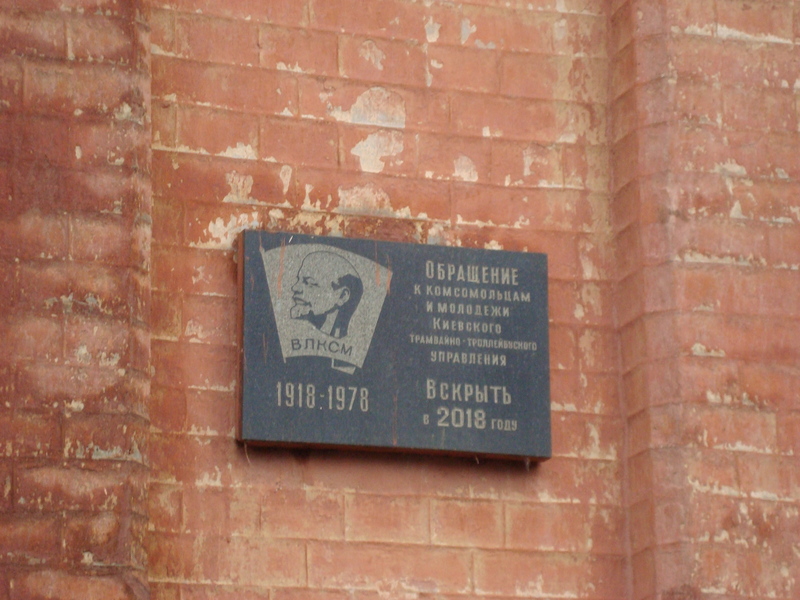 The words on this plaque say that it is an address to the komsomols and youths of the tramway depot and ask to open the niche and read the message in 2018 — the centenary of the Young Communist League (Kommunisticheskiy Soyuz Molodyozhy, i.e. 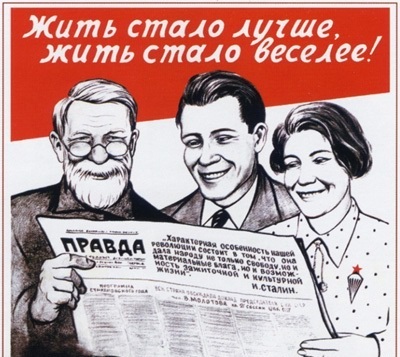 the Komsomol). Putting ideology aside, I think about how short-sighted and naïve people are! They are like one-day flies imagining life as something warm and sunny and bright, of which there is no end. Meanwhile, the tramway depot has turned into ENTRÉE, the working class is non-existent, and nobody cares about the niche. In my opinion, it will be opened in 2018 only if you give some money and a crow-bar to a few youngsters and ask them to do it. Incidentally, communism in the minds of the soviet people was almost never connected with something negative. The idea of communism (Nikita Khrushchev said it would come after 20 years) was that you would consume as much as you wanted, you would work as much as you preferred, and no worries or troubles would overwhelm you. When our cat Klaptyk used to stretch on the desk under the reading lamp on a wintry evening (generally, after his supper), we always said that he lived “under communism”. Early this month ten Russian spies were caught in the U.S.A. and later exchanged for four American spies who had been serving their prison terms in Russia. There was much ado about it in the world media. I am not sure about the four who were deported to the U.S.A. but the Russian Ten were given a hero welcome in Russia. Officially it was announced that they will be receiving a monthly allowance of $2,000 till the end of their lives. 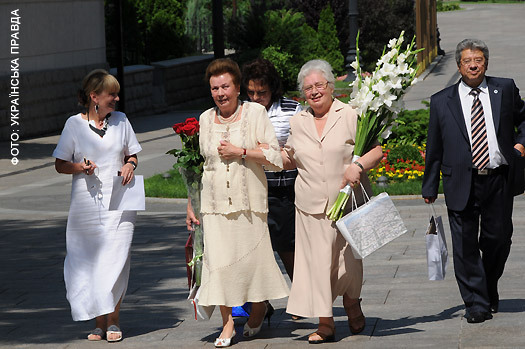 The city of Volgograd, the birthplace of the femme fatale Ann Chapman, offered her honorary citizenship. Incidentally, such citizenship was granted to only to very special people – among them there were the generals who defended Stalingrad (as Volgograd was then named) during WWII and Queen Elisabeth II (for her role in the struggle against fascism in the war time). That’s the thing which keeps me puzzled: why is spying an act of heroism in Russia? Why are spies aggrandized and revered only a little less than cosmonauts in that country? And it has always been so. Taking into account that most of the spies caught are now in their late 20s or early 30s and that they have lived in the U.S.A. for 8-10 years, we may conjecture that they were recruited by the KGB about the time when they finished (or were finishing) their secondary school. My father used to uphold strong anti-communist views. 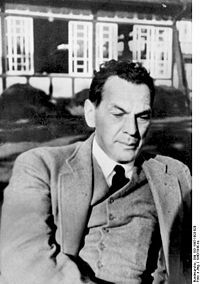 But even he deeply respect Richard Sorge and Rudolph Abel and took me to see the film Who Are You, Mr Sorge? the moment it started being shown in the Soviet Union in 1964. When Nikita Khrushchev saw the film he asked the KGB whether the story was true. When it was confirmed that it was indeed true, Khrushchev posthumously awarded Sorge the title of Hero of the Soviet Union on 5 November 1964. In addition Sorge’s widow Hanako Ishii received a Soviet pension. So far I do not know the answer to the why-questions which I asked in the second passage. It may be a KGB secret 🙂 I may only say that I observed something similar in a Palestinian camp in the vicinity of Beirut which I visited in 1973. There were portraits of “fighters” hung up in almost every shack. They were those who had died in anti-Israeli terrorist actions. “We don’t put up the portraits of those who are alive”, a Palestinian explained to me. Every day the FM Radio CULTURA broadcasts a 15-minute story – either a Ukrainian original or a translation into Ukrainian. It’s interesting to notice the difference between stories as regards the time of their creation. The day before yesterday the story was The Gift of the Magi by O. Henry. Jim and his wife are a young couple. They can barely afford their one-room apartment. For Christmas Della decides to buy Jim a fob for his prized pocket watch given to him by his father’s father. To raise the funds, she has her long, beautiful hair cut off and she sells it. Jim decides to sell his watch to buy Della a beautiful set of combs made out of tortoiseshell and jewels for her lovely, knee-length brown hair. Although each is disappointed to find the gift they chose rendered useless, each is pleased with the gift that they received, because it represents their love for one another. 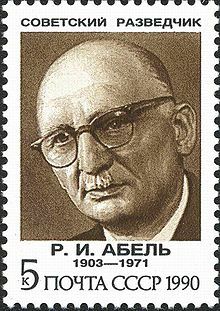 The yesterday’s story was written by a well-known Ukrainian author of the 1960s Hryhir Tyutyunnyk. The I-narrator is a teenager. 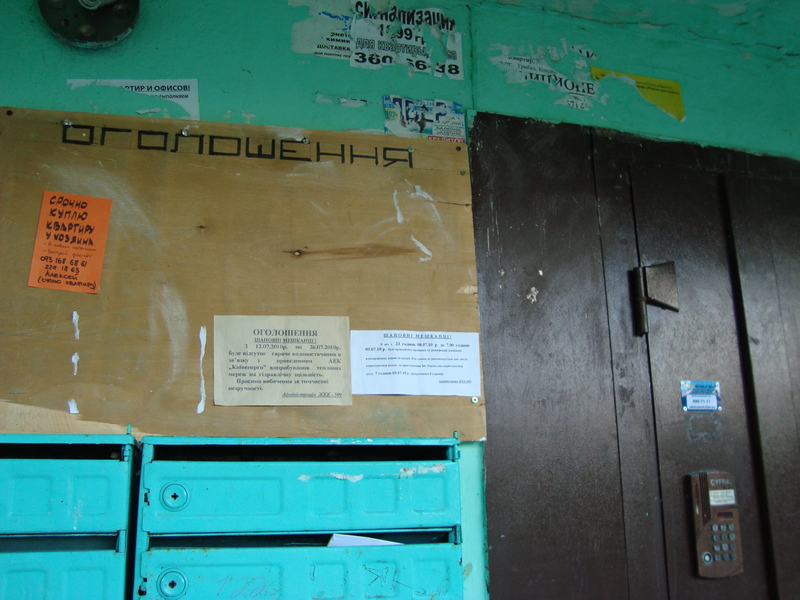 He and his mother live in a Ukrainian village. The father is at the front fighting Germans – just as almost all the menfolk of the village. The boy’s mother practices divination and the son helps her in it. Practically every day some women come to their place asking the mother to augur and tell them whether their husbands are still alive in the war or not. The instrument of sorcery is a sieve (actually, that’s the name of the story: The Sieve). The sieve is balanced on a special support and the boy is responsible for operating it. After the mother’s brief incantation the sieve is given a spin and the condition of the soldier in question (“alive or dead”) is divined by the tilt of the sieve at the end of its rotation. Presumably, the sieve rotates freely and tilts wherever it will, but the boy has a secret knowledge of how to “help” the sieve so that it will stop in the position of “alive”. And he always does it, giving hope to visitors. 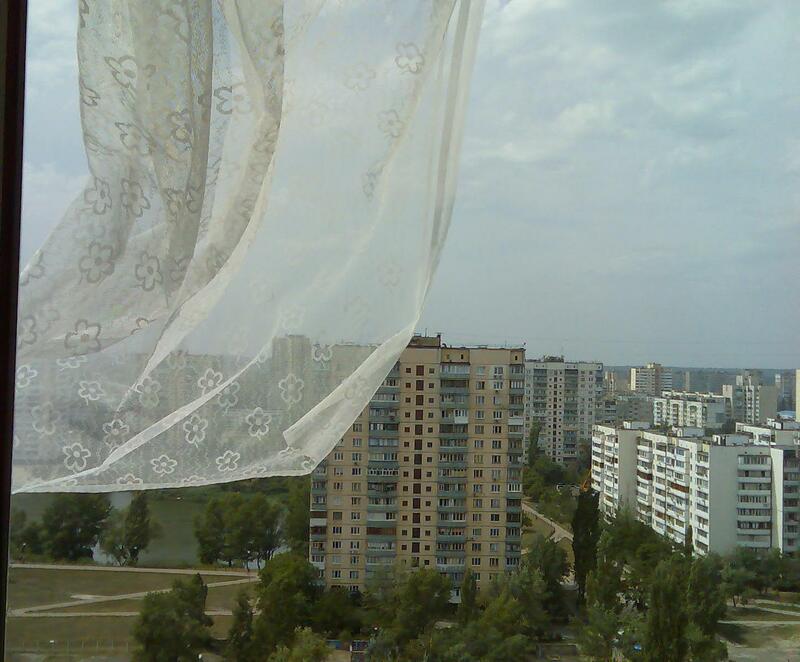 The story “The New Tights” by the modern Ukrainian writer Eugeniya Kononenko is about a two-generation family: the husband and wife live in the same apartment with the husband’s mother, which causes much friction between the mother and the daughter-in-law. The mother gets ill and is hospitalized. A surgery is required but the family has no money for the operation. The surgeon (“a tomcat”) agrees to operate on the old woman “even for a bottle of cognac” provided this cognac is brought to his home personally by the daughter-in-law. The mother comes to know about the doctor’s suggestion and insists on the daughter-in-law’s committing adultery to “buy the surgery”. The husband, being seemingly neutral, actually sides with his mother’s demand. The wife yields to the circumstances and carries the cognac to the surgeon. For what little remains of their money she buys new tights for herself which she puts on instead of the old ones having holes in them. She changes the tights in the dark entrance hall before she comes to the doctor. The surgery is successfully performed though the mother dies two years later of another disease. Now, every time when the wife is angry with her husband she describes the luxurious interior of the surgeon’s apartment with an emphasized delight. In 2001, a 12-year secondary school education system in Ukraine replaced an older 11-year one. Those who began their education in 2001 or later were supposed to stay at school for 12 years instead of 11. As a result no graduating seniors were expected in Ukraine in 2012. However, last month the Ukrainian parliament has cancelled the 12-year secondary school and returned to the former 11 grades. The main motivation: 18-year-old students are psychologically more ready to work, study at universities or even get married than to push the pen at secondary schools. The motivation seems to be poorly substantiated. If in some countries of the Middle East and Asia girls are officially allowed to get married at age 15 or 14, it does not mean that secondary schooling should be lowered to that age level. On the other hand, with the rapid increase in the amount of published information and the effects of this abundance of data, students should be taught how to cope with the information overload. They should also have time for cultural self-enrichment and for physical development. Isn’t it logical that secondary schooling lasts 12 years in major developed countries (like Australia, Spain, Sweden, the U.S.A.), also reaching 13 years (Great Britain, France, Italy), or even 14 (Finland)? The standards of education will hardly be raised with these spasmodic actions. I may also agree with some bloggers who remark that those who rule Ukraine are not interested in people being highly educated. The half-taught are easier to manipulate politically. And if the powers-that-be would like to educate their own off-springs, they will always be able to send them to the best schools abroad – just as they go to the best clinics in Germany, resorts in Mallorca, or golf-courses elsewhere in the world. It is also sad that the universal national testing, which is now a pre-requisite for entering any university without special admission examinations arranged by universities themselves, may be liquidated. Even this year a student’s grades s/he has in their certificate are to be counted alongside the results of the UNT when a student is admitted to a university. The consequence of this regulation introduced only a couple of months ago is that the number of “medalists” (the graduates who finish school with top grades only) has amounted to 10,855 this year, which is a 50 per cent rise as compared to 7,040 students in the year 2009. Birthdays of Ukrainian presidents are a special case. The dates are supposed to be known to an average Ukrainian and, generally, they ARE known. 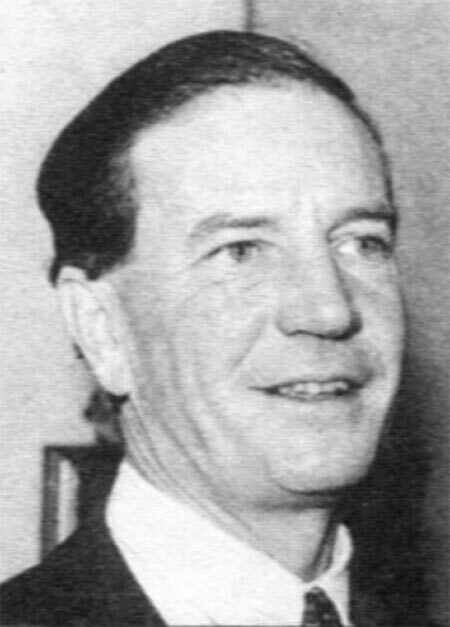 The previous president was born on February 23, the one before him – on August 9. The tradition of keeping such dates in mind may be rooted in the soviet tradition: every citizen of the U.S.S.R. knew that April 22 was Vladimir Lenin’s birthday. When I moved to a new school in Russia my teacher said to me much later: “Vitaliy, I remember the day when you came to our school. It was on December 21 – Stalin’s birthday.” Interestingly, she said it when Stalin’s personality was already exposed and the dictator’s body removed from the Mausoleum in Red Square where he had been originally placed next to Lenin. My explanation of this “birthday phenomenon” is that power in Ukraine as well as in other states of the ex-U.S.S.R. is based not on ideology but on the fact that some certain clans (“families”, “oligarchs”) start possessing the country. So, birthdays of clans’ leaders are pretexts to demonstrate loyalty to the clan-in-power. 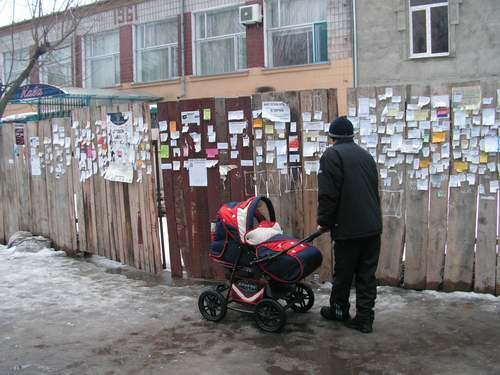 As far back as in the middle of the 19th century the Russian poet Nikolay ]Nekrasov wrote in his poem “Reflections at the Front Gate” about droves of subordinates who, on some special dates, being stricken with the “lackeys’ disease” come to the front gate of their superior’s place to pay respects and present compliments. The current Ukrainian president Viktor Yanukovich celebrated his 60th birthday last weekend. The festivities lasted three days. They began in Kyiv and continued for two more days in the Crimea – on the Black Sea coast. The Kyiv part of the event was about gift-giving. Those who were privileged to get into the category of gift-givers were issued invitation cards with the state emblem on it. Was it to emphasize that the birthday was not a private matter but a nationwide enterprise? Six Mercedes buses brought to the President’s office those who were considered worthy to appear before his Highness. Journalists had not been selected for it. They came on their own. Before they had chipped in and bought a bike as a present. 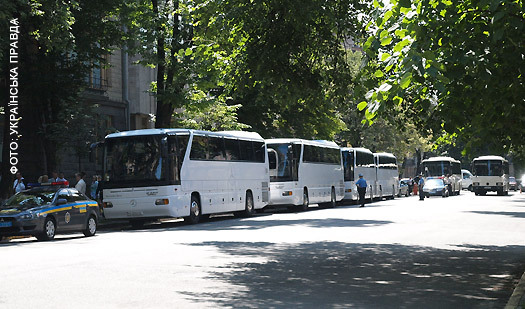 The thing is that the Ukrainian president travels in a chauffeured car with a dozen other cars following in the wake (once an ambulance which was a part of the presidential cortege dashed into a taxi and the taxi-driver died in the accident). 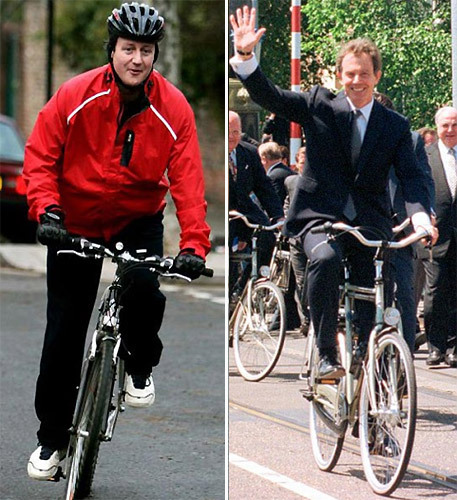 Other leaders of states are known to use bicycles when they travel to work in the mornings. The journalists saw no reason why the Ukrainian president shouldn’t follow their example. The clerks who took presents on behalf of the president were at a loss this time: shall they accept the present or not? 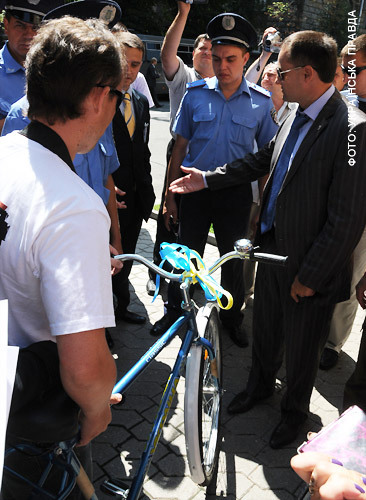 The police were also looking suspiciously at the bike (“Doesn’t it contain a bomb?”). After some consultations over the phone the clerks placed the bike placed at the door of the neighboring building and left it unattended. The bike stayed there till the very evening when the concierge asked the journalists’ permission to take the bike for her orphaned grandson (“Otherwise it is sure to be stolen at night”). 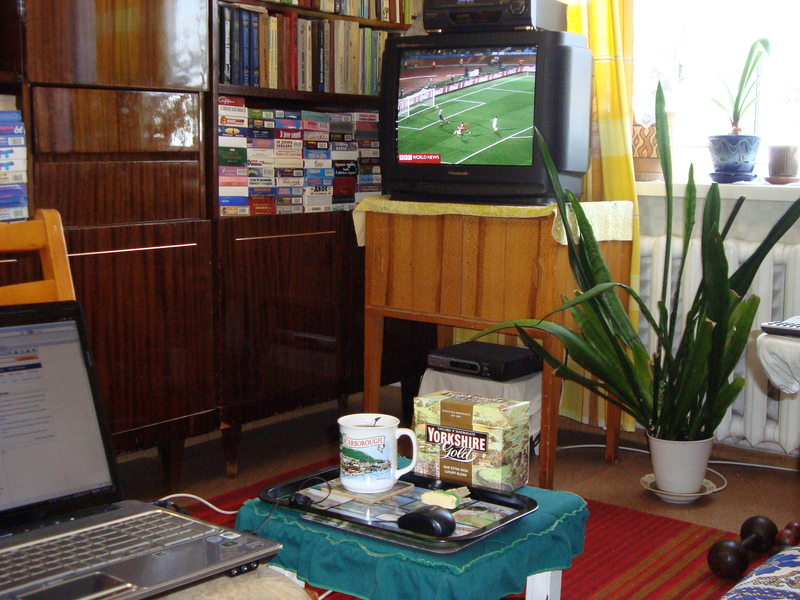 Forty-four years ago not many people were watching the FIFA World Cup matches: they were mainly listening to them as there were not so many TV sets in the Soviet Union and most matches were broadcast over the radio. In 1966 I had just finished secondary school and was getting ready to take my entrance exams to the English-language department of a local pedagogical institute. Naturally, I rooted for England. For some reason (I guess there was something wrong with our radio receiver at home) I was listening to the broadcast of the final match between England and Germany while standing outside in the yard under somebody’s open window. It was an apartment on the ground floor of a five-storeyed block of flats and there was a television in the apartment. I could not see it, but the television was going full blast and my imagination was immediately transforming the commentator’s words into pictures which might have been no less vivid than the real pictures on TV. On that day forty-four years ago England won 4:2. The crucial goal was scored in extra time by Geoff Hurst. His shot hit the crossbar, the ball bounced down and hit the ground either onto or just over the goal line. Whether the ball actually crossed the goal line or not has been a matter of discussion for decades, and this goal, known as the “Ghost Goal”, has become part of World Cup history. At that time I was so proud that the linesman from the U.S.S.R. Tofik Bakhramov was sharp-sighted enough to have spotted that the ball HAD CROSSED the goal line Recent digitally-enhanced footage, however, is said to clearly illustrate that Geoff Hurst’s second goal did not cross the line. 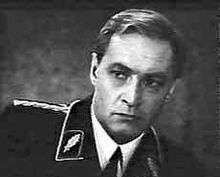 Some Germans cited possible bias of the Soviet linesman especially as the USSR had just been defeated in the semi-finals by West Germany. This time I got ready to WATCH the game between England and Germany in South Africa by putting some English paraphernalia at my side(see the photo) to increase the comfort of watching. It was a BBC television channel, so I could listen to the coverage being done in English. There were three reporters presenting their observations collectively and each of them had some special regional peculiarities of pronunciation. I was enjoying it. In an amazing way, the Germans got their revenge 44 years later! With Germany leading 2–1, a shot from Frank Lampard hit the crossbar, bounced into the goal and bounced out. The match officials did not award England the goal that would have made the score 2–2, but television replays showed the ball clearly crossing the line and falling about 0.5m inside the goal. Eventually, Germany went on to win 4–1. In 2010 I understood how the German fans had felt in 1966. 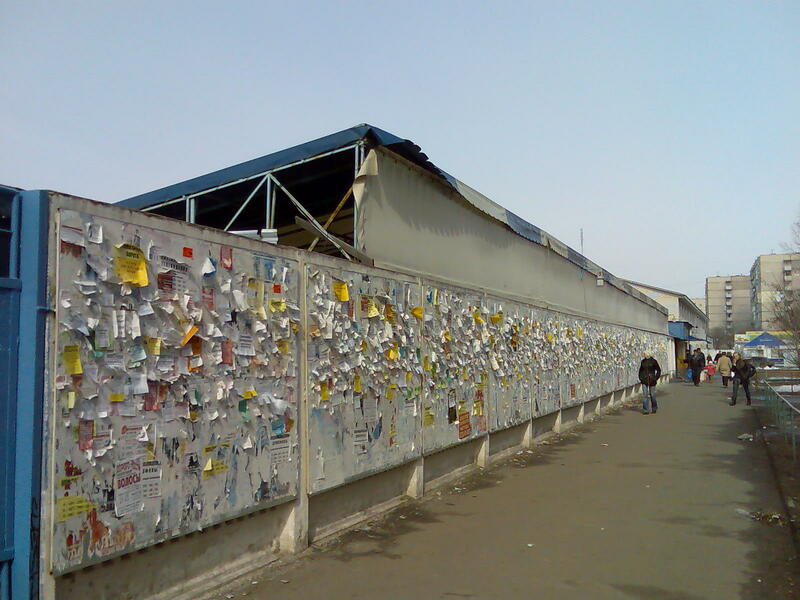 Kyiv is plagued with disorderly advertizing. 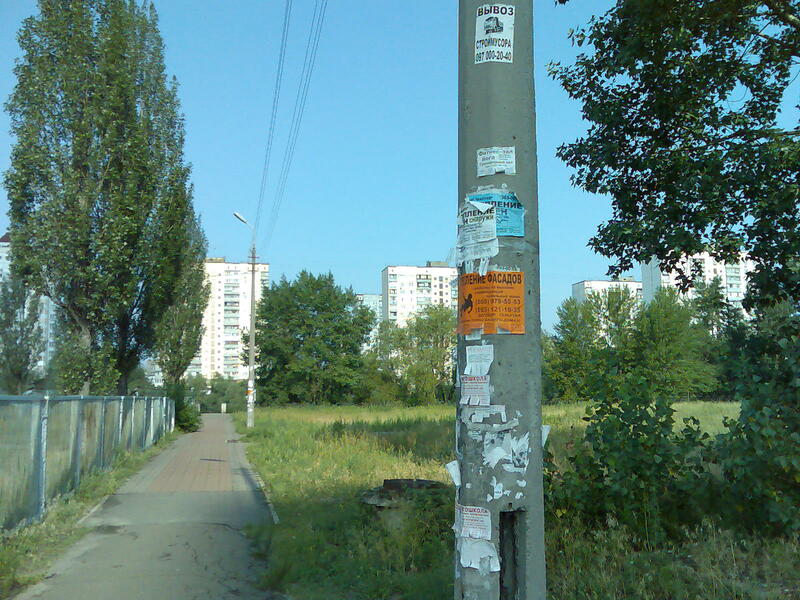 Improvised notices offering everything under the sun have avalanched the walls of buildings, fences, lamp-posts, sliding doors of metro cars… Even people are turned into objects on which adverts may be hung. In my student years I read about sandwich-men in “bourgeois” countries whose job was to wonder about humiliatingly carrying big advertising boards on their chests and backs. 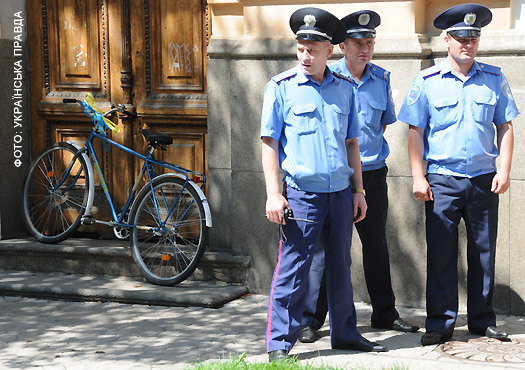 Now you may see sandwich men in the Ukrainian capital. 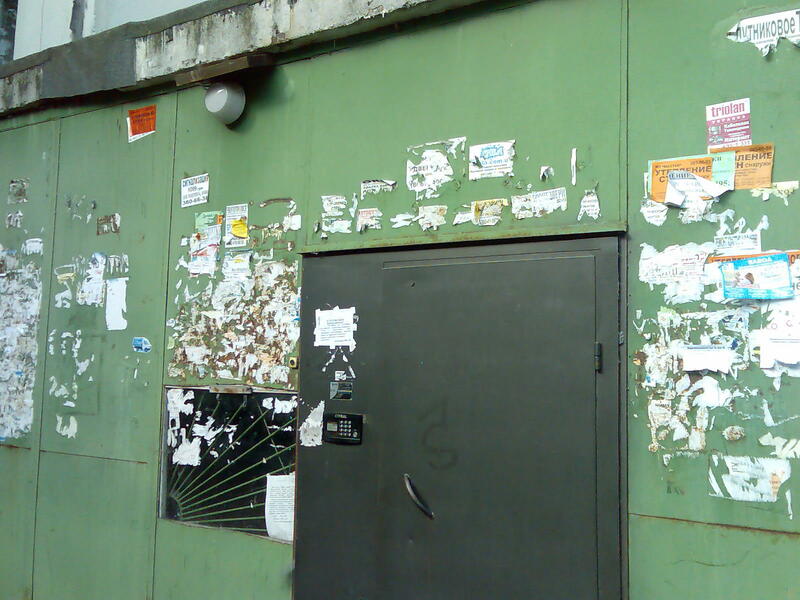 Among other things, entrance doors to apartment buildings are also pasted all over and are a sad sight to see. They are especially irritating because you can bypass other places but you get through entrance doors of your apartment building several times a day and every time the info about dozens of products and services that is printed on a wide variety of paper formats is crammed into your eyes and head – crammed in an unashamed and merciless way. 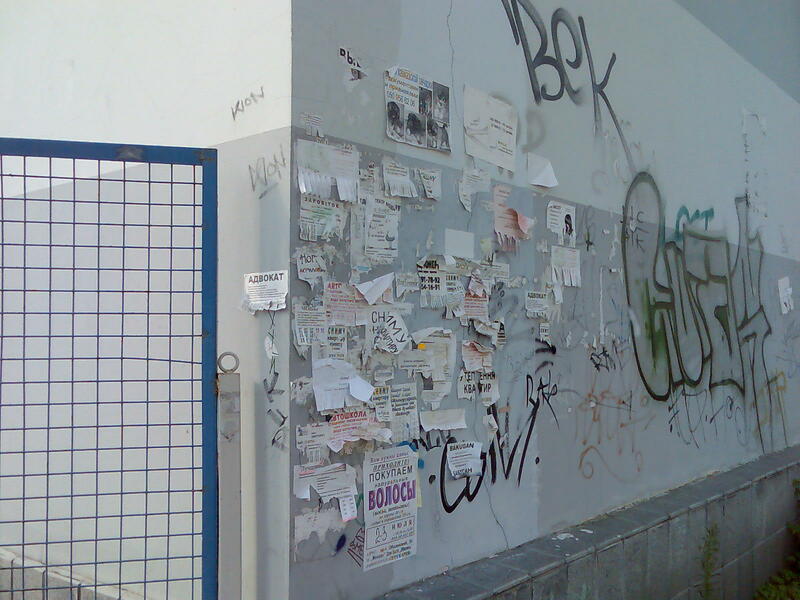 And you will never see those who put adverts on: they are like ghosts, they are never to be caught or even perceived. While at home I rummaged in my utility room for a piece of plywood and a couple of planks and it took me about an hour to get ready with a notice board. When I nailed it up next to the door it was almost dark outside. P.S. 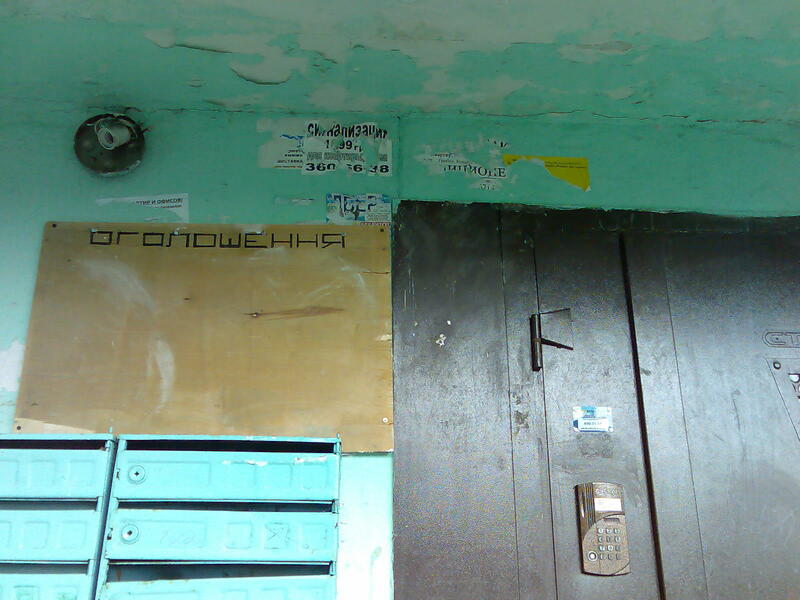 Two days have passed since the door was washed and the board for adverts fixed. No new notices have appeared. Neither on the board nor on the door. How shall it be understood? When Mykola Azarov, the Ukrainian Premier, was speaking about the achievements of his government some two weeks ago he pronounced the phrase “Life has become better, life has become merrier”. My generation knows that it’s a quotation from Stalin: the Soviet dictator pronounced the words in 1935 to describe the headway made by the U.S.S.R. This motto was carved on the wall of one of the buildings on the central square in the town where I used to live. Alexander Solzhenitsyn remembers in his “Gulag Archipelago” that in the accountants’ office at some collective farm this citation was followed by the dictator’s name to indicate the authorship. Some anonymous person joined the Cyrillic letter “у”to the end of the name, which turned the name “Stalin” from the nominative to dative case and the sentence acquired the meaning: Life has become better and merrier FOR Stalin.”They did not look for the offender”, continues Solzhenitsyn. “The whole of the accountant’s office was sent to gulag”. However, not only the letter but also the intent of Stalin’s pronouncements materialized in Ukraine just a week after the premier’s speech. Last Sunday Nico Lange, Director of the Kyiv Office of the Konrad Adenauer Foundation, was detained at Kyiv Airport for around 10 hours. He was informed that he was being refused entry and that this was on the instructions of the Ukrainian Security Service [SBU]. No explanation was given. Most worrying, none seemed required given the hard-hitting article published by Nico Lange just a few weeks ago to mark President Yanukovych’s first 100 days in office. I read the article. It was posted on the official site of the Konrad Adenauer Foundation on May 27 under the title “The First 100 Days after Change of Power in Ukraine: Authoritarian Tendencies and Rapprochement with Russia” (see http://www.kas.de/proj/home/pub/47/2/year-2010/dokument_id-19723/index.html ). In the five-page article Nico Lange in no uncertain terms denounces the new government by giving blunt facts: the ruling coalition was formed with the blatant violation of the Ukrainian constitution, under the new political constellation the role of parliament is brought to the minimum (now its function is only to sign-off the politics of the president), the advisory institutions and committees, such as the Center for Euro-Atlantic Integration, have been simply closed down, local elections that were first scheduled for May 30, 2010, have been suspended, journalists from national TV stations complain about censorship and manipulation, opposition is given practically no time on television and all free and independent reporting is forced back to the printed media and the Internet where it cannot reach the wider part of the Ukrainian population. Ukraine’s Interior Minister said that all meeting and rallies of the opposition should be held OUTSIDE Kyiv, etc. Thank you, Nico Lange. It was like an honest voice I had used to hear when my Dad listened to a jammed radio station so many years ago (see my yesterday’s entry). 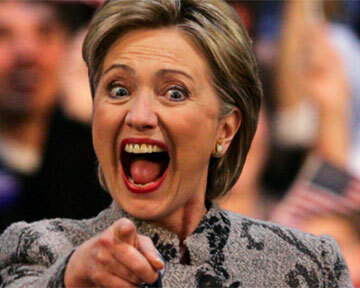 Yesterday Hillary Clinton was visiting Kyiv. The first sign of her arrival was too many cases of lateness and absenteeism at the company where I work: the employees couldn’t get through cordons of the traffic police who were blocking the center of the city giving green light to the U.S. Secretary of State long before she actually arrived. Mrs. Clinton came to reassure the former Soviet-bloc countries that the American reset of relations with Russia will not affect the relations between the U.S. and these countries. Ukraine was Mrs. Clinton’s first stop-over on her tour of Eastern Europe and the Caucasus. It’s hard to believe Mrs. Clinton’s words. It looks like the United States and Russia have already agreed to divide the spheres of influence: America is going to be more concerned with Asia (Iran, Iraq), while Europe has been given over to Russia. Another proof of the new global order was the U.S. refusal last September to deploy anti-ballistic missiles in Poland and the Czech Republic and Mr. Obama’s non-attending the EU-USA summit in Madrid last May. The United States – with its mortgage crisis, credit crunch and health reform – can certainly be understood. I may also agree that the behavior of this superpower on the international arena has not always been perfect. But… without America there wouldn’t have appeared South Korea which later turned into an Asian economic “tiger”: there would be one Korea which now bears the attribute “North”. Without America there would be no Israel as it exists now, and without America communism would have spread after WWII all across the whole of Europe swallowing Spain and France. You are currently browsing the BLOGGING IS LIVING blog archives for July, 2010.